A-HOTEL.com - Luxusné a lacné ubytovanie Tushemisht, Albánsko. Ceny a rezervácia hotelov v Tushemisht a v okolí. Toto je orientačná ponuka najviac rezervovaného ubytovania v destinaci Tushemisht za poslednú dobu a je radená od najlacnejšieho ubytovania až po najdrahšie hotely. Pre výber ubytovania podľa Vašich preferencií odporúčame vyberať z celkom 6 ponúk ubytovanie v Tushemisht. Po zadaní dát svojho pobytu a použitie filtra si môžete vybrať najlepšie možné ubytovanie v destinácii Tushemisht. Zadaný dátum pobytu je pre presný výber miesta na prespanie kľúčové, pretože sa od neho odvíjajú všetky on-line informácie o cenách a obsadenosti ubytovania. Vybrané miesta na prenocovanie (hotely, apartmány a pod.) je potom možné ihneď rezervovať. Apartmán Nuci sa nachádza v meste Tušemišt a má bezplatné Wi-Fi. Tento apartmán má 2 spálne, 1 kúpeľňu s bidetom a satelitnú TV. Kompleksi Caushi is situated in Tushemisht and features a garden. Featuring a 24-hour front desk, this property also has a restaurant and a children's playground. 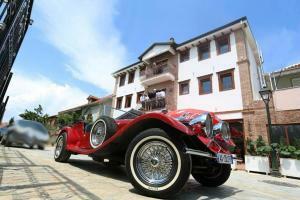 Featuring a terrace and free WiFi, Vila Dante Boutique Hotel is located in Tushemisht. Offering a restaurant, the property also has a bar. Gegprifti is set in Tushemisht and offers water sports facilities, free bikes and a casino. With mountain views, this accommodation offers a terrace. Vila Deni features accommodation with a garden and free WiFi. Some units also have a kitchen equipped with an oven. Vila Ilo is set in Tushemisht. Among the various facilities of this property are a garden and a terrace. With its large furnished terrace extending over Lake Ohrid, Hotel Millennium offers free Wi-Fi, elegant rooms and an à la carte restaurant serving the famous Ohrid trout. The lush Drilon National Park is just 500 metres away. Hotel Dea offers air-conditioned accommodation in Pogradec. Boasting a 24-hour front desk, this property also provides guests with a restaurant. Set in a 9th-century monastery, on the south-eastern shore of Lake Ohrid, Hotel St Naum offers guided excursions on its own private boat. Rooms have a view of the lake or the mountains. With mountain views, Villa Braho 1 has accommodation with a kitchen set in Pogradec. Complimentary WiFi is available. Vacation apartment with Lake view is located in Pogradec. Guests staying at this apartment have access to a fully equipped kitchen and a balcony. Guest House Pogradeci provides rooms in Pogradec. All rooms feature a kitchen and a private bathroom.